Two intriguing plays at two of my favorite small theaters: Ivywild: The True Tall Tales of Bathhouse John at The Hypocrites and In a Garden at A Red Orchid Theatre. Both are still running; details below. 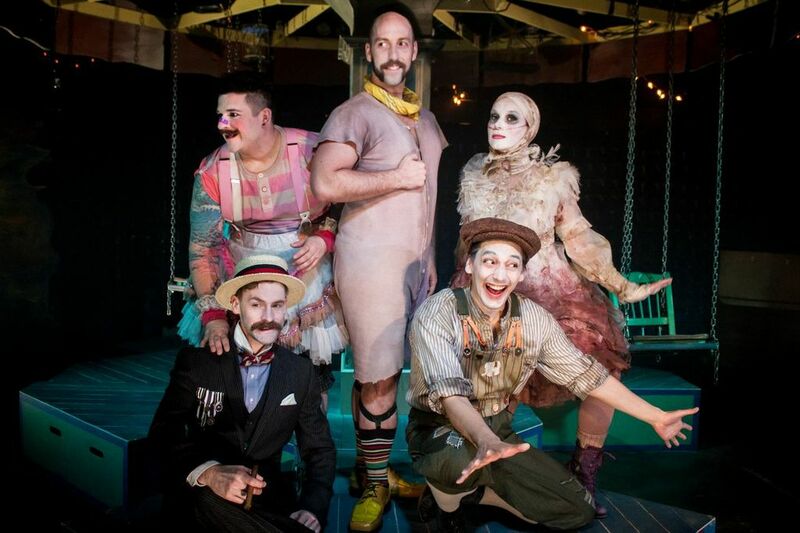 Ivywild: The True Tall Tales of Bathhouse John, the new play by the ever-audacious The Hypocrites http://www.the-hypocrites.com, is part carnival, part Chicago history lesson, and it is a delightful 90 minutes of fact mixed with fantasy. The play is written by Jay Torrence and directed by The Hypocrites’ artistic director, Halena Kays. Torrence plays “Bathhouse John” Coughlin, the First Ward Alderman of Chicago during the 1890s, when the 20-square block area around Cermak and Michigan was the levee district, populated by saloons, brothels, gambling houses and plenty of corruption to fund it. Michael “Hinky Dink” Kenna, the precinct captain and later the second First Ward Alderman, is played by Ryan Walters. (Until redistricting in 1923, each Chicago ward had two aldermen.) The two amass great wealth through the levee district businesses, political corruption and general debauchery. Ivywild is the amusement park and zoo that Bathhouse John actually built on a tract of land near Colorado Springs, where he has bought a second home. Coughlin meets young Walt Colburn (Kurt Chiang) there and makes him his personal assistant. Colorado, at that time, was home to hundreds of tuberculosis sanatoriums, where patients from all over the country would go to seek relief. Those are the factual threads that are woven throughout the play. Torrence’s Bathhouse John as a song and dance man—a pol who sees himself as a poet and songwriter, as well as the creator of a grand amusement park. His sartorial flamboyance was legendary. Hinky Dink Kenna was more conservative in dress and demeanor, and tries to push his partner to return to Chicago and pay attention to First Ward business. This Chicago duo suggests how Chicago won its reputation as a center for crime and corruption, even before the arrival of Al Capone. Ivywild runs through June 16, so please be sure to see it. The Hypocrites perform at the Chopin Theatre, 1543 W Division St. Shows are at 7:30 pm Monday, Friday and Saturday and at 3pm Sunday. A Red Orchid Theatre http://www.aredorchidtheatre.org is presenting In a Garden by Howard Korder, a fast-moving and smartly written play in nine scenes spanning 15 years from 1989 to 2004. 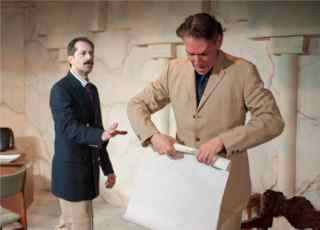 The play portrays the frustration of an ambitious American architect (played by Larry Grimm) proposing a design for a fictitious Middle Eastern country named Aquaat, which might be Iraq. The architect has not had a successful career; he has several proposed and unbuilt projects in different countries and the minister refers to him as a second-tier architect. He is desperate to see one of his designs built, which may explain why he suffers through years of ambiguity and misdirection from his client (or patron, as the minister prefers). It’s never clear who is making the decisions or if in fact a decision will ever be made to build the gazebo in a peaceful garden of lemon trees so desired by the minister. In the final scene in 2004, everything has changed: the space, the architect’s professional goals and the minister’s status. The gazebo was finally built, but now is gone. The lemon trees remain – to be enjoyed by the office’s new occupant: an American army officer. In a Garden runs through Sunday, May 19, so you still have a chance to see it. Shows are at 8pm Thursday, Friday and Saturday and 3pm Sunday. A Red Orchid Theatre performs at 1531 N. Wells St.
Slightly different versions of these reviews appear at gapersblock.com, a Chicago website, on the A/C or Arts page. I’m using WordPress and since I am using the basic version, rather than the professional one, it’s hosted by WordPress. I suggest you ask techy friends or use one of the many support forums to get recos for a new hosting service.